Want cheap, effective laundry detergent without synthetic toxins? 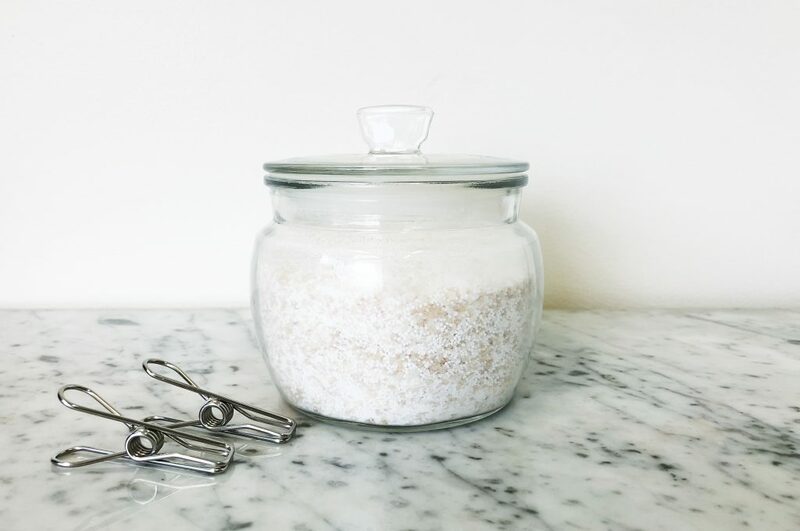 This Homemade Laundry Detergent is 100% natural, free from synthetics, has antifungal, antibacterial and antiseptic properties, and is cheap when the ingredients are bought in bulk. Your clothes will get a great wash with as little cost to you as to the environment. Here is what we’ve used and why. Coconut Soap Flakes are freshly grated from 100% pure coconut soap, so its antibacterial and antifungal properties mean your clothes will get a thorough clean. Bi Carb is a natural deodoriser, making it powerful on smelly washing. It also has antifungal, antibacterial and antiseptic properties. Oxygen Bleach is a natural alternative to Chlorine Bleach – it brightens clothes, removes stains, is great for colours, and all without the harsh synthetics. It also disinfects clothing from household bacteria. Washing Soda acts as a natural laundry detergent and softens water, making the soap and sudsing more effective (1). Place all the dry ingredients in a blender or small electric coffee grinder. Blend on high for one minute to ensure all ingredients are combined into a powder. Add essential oils and blend to combine if desired. Store in a sealed glass jar out of sunlight. Put 2-3 tbsp of the homemade laundry detergent in your washing machine dispenser, or in a tub of water to hand wash. If hand washing, use warm or cold water and let the mixture dissolve completely before adding clothes. Safe for front and top loading machines. Dissolve first if using in a top loading machine. Looking to simplify, reduce waste and know exactly what you are putting on your skin? At Biome’s Naked Beauty BarTM, you will find all of the beautiful raw ingredients you need to make your own natural skin care and cleaning products. These ingredients are available in convenient reusable glass jars, and in bulk from our Indooroopilly and Balmoral stores. Share your Naked Beauty BarTM DIY skin care and cleaning products with us by tagging your photos with #BiomeNakedBeauty on Facebook and Instagram. It doesn’t make any reference, so it would be great if you can edit the article or advise if this is safe for front loader machines (as well as top loading) ? Generally a little extra care is needed for front loaders so I’d appreciate any variations or confirmation before using this. Hi Cam, this is ok for use in front and top loading machines. We’ll update the article. Thanks! Every DIY Cleaning Recipe You Need To Clean Your Space Naturally! The Marie Kondo Effect – Where Do My Unwanted Clothes Go Now?